(CNN) -- Andy Murray's title defence at the Madrid Open came to an end late on Friday as he lost his quarterfinal match to Juan Martin Del Potro in straight sets. 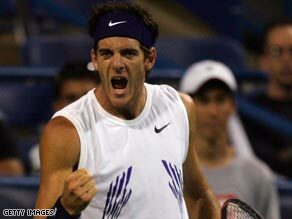 Juan Martin Del Potro bundled defending champion Andy Murray out of the Madrid Open on Friday. World number three Murray, on his birthday, had his chances but it was fifth seed Del Potro who came out on top 7-6 6-3 to seal a semifinal showdown with Roger Federer. In contrast, top seed Rafael Nadal, Federer and Novak Djokovic are all through to the semifinals, although they experienced varying degrees of fortune on Friday. Second seed Federer secured his 18th career victory from 20 matched with old rival and sixth seed Andy Roddick, but the American put up a fight before wilting in the Spanish sun as the Swiss eventually reached the last four 7-5 6-7 6-1. Third-seeded Serb Djokovic reached his fourth consecutive semifinal at Masters level with a 6-4 6-4 win over Croatian wild card Ivan Ljubicic. Djokovic will now face world number one and clay-court king Nadal, who was handed a walkover on Thursday, who ousted fellow-Spaniard and seventh seed Fernando Verdasco 6-4 7-5 in the late match. Meanwhile, top seed Dinara Safina is through to the semifinals of the women's event with a 6-4 6-3 win over Ukrainian Alona Bondarenko. Meanwhile, former world number one Amelie Mauresmo, who is unseeded here, continued her recent run of good form by fighting back to defeat Hungarian Agnes Szavay 5-7 6-1 6-1.